Racing fans packed Monmouth Park on August 1, 1987 hoping for a fantastic finish between Bet Twice and Alysheba, whose yearly-long duel had already produced photo-finish victories for Alysheba in the Kentucky Derby and Preakness, followed by a 14-length blowout for Bet Twice at the Belmont. Bet Twice won two more time in their nine meetings, including the Haskell. The crowd got its money’s worth on this day. The two horses let Lost Code maintain a slim lead until the home stretch, when they went-neck-and-neck, with Bet Twice winning on the outside. Another memorable stretch run at the Haskell saw three horses gallop side-by-side toward the finish line in 2001. Preakness and Belmont winner Point Given—nicknamed T-Rex—came out of the final turn two lengths behind Touch Tone. The two horses, along with Burning Roma, powered toward the finish, with Gary Stevens whipping Point Given a half-length ahead for an unforgettable victory. Just as memorable was the disagreement between Stevens and trainer Bob Baffert in the winner’s circle. Stevens had discarded Baffert’s race strategy, to the trainer’s obvious displeasure. After exchanging words, Stevens stormed off, saying he’d been riding for 22 years and knew how to ride this horse. The Haskell had raised its purse to $1.5 million specifically to lure Point Given, so there was tremendous pressure on both Baffert and Stevens to win the race. Was Somebeachessomewhere the greatest pacer in history? In the summer of 2008, many fans would have answered with a resounding Yes! 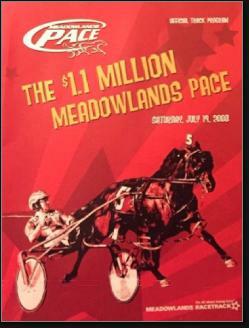 On the evening of July 19th in the Meadowlands Pace, Art Official—driven by Ron Pierce—rewrote history. In a race that featured a thrilling three-wide pass and a stretch run between Art Official and the 1-to-9 favorite that produced a record-shattering victory for Pierce. His time of 1:47 was the best ever race mile for a 3-year-old and the second-fastest ever. It was the 6th victory in 27 starts for Art Official, and the first loss for Somebeachessomewhere. Art Official’s win may rank as the most unexpected result in New Jersey harness racing history, but the most magnificent stretch run belongs to Cam Fella. In the 1983 Summer Championship (also at the Meadowlands), Cam Fella—driven by Pat Crowe—led the race most of the way before fading in the final turn. Its Fritz grabbed the opportunity and began pulling away, opening up a normally insurmountable three-length lead with 200 feet to go. Cam Fella suddenly found another gear and Crowe guided him to an unlikely victory. For more than a quarter-century, the Haskell Invitational Stakes at Monmouth Park had seen nothing but male horses finish ahead of the field. 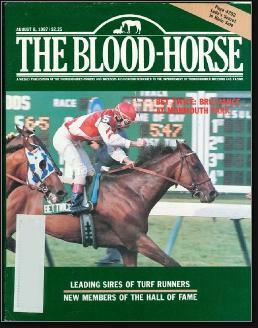 That changed in 1995, when Gary Stevens won his second career Haskell aboard Serena’s Song. Though female spectators had extra reason to stand and cheer, few in the crowd were shocked at the race’s outcome. Serene’s Song was a prohibitive favorite. The small-but-athletic 3-year-old filly won 9 of 13 starts that season, including the Black-Eyed Susan Stakes at Pimlico. She won $1.5 million in 1995 and was named the American Champion Filly. Serena’s Song was inducted into the Racing Hall of Fame in 2002. Fourteen years after the 1995 Haskell, Rachel Alexandra became the second filly to win. The 1–2 favorite stayed off the lead for most of the race before exploding for a six-length victory—beating Belmont winner Summer Bird and finishing just .4 seconds off the Monmouth Park track record. Earlier in the summer, Rachel Alexandra had become the first filly in 85 years to win the Preakness. In all, the horse with the upside-down exclamation-point blaze started and won 9 races in a row and was named 2009 Horse of the Year.